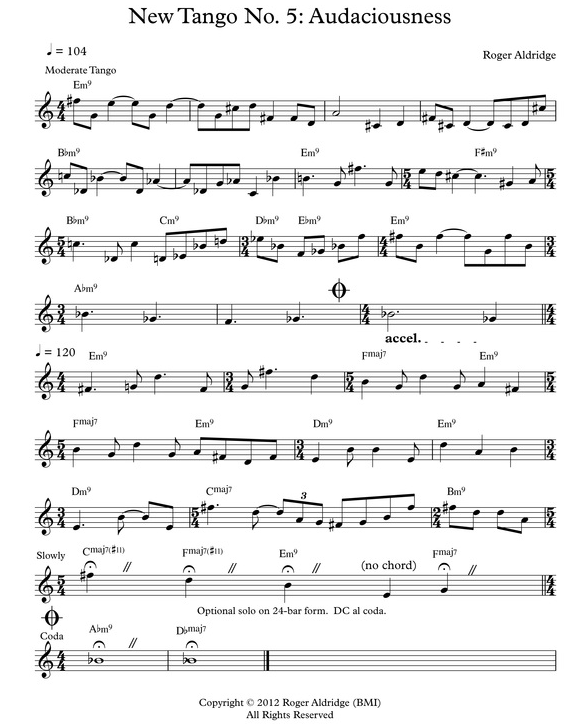 This piece is part of a series of tango-jazz compositions. 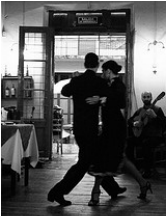 Each one explores a particular quality of the tango. Number 5 is about laying aside feelings of hesitation and being bold (or audacious) in the spirit of tango. It was originally written as Movement 7 in my composition Donut Music, an extended piece for solo guitar. However, I liked this tango so much that I decided to also have it as a separate piece. Recorded by Keith Calmes, guitar. New Tango No. 5 has a number of unusual features. Harmonically, only minor 9th and major 7th chords are used and the the chord progression has unusual relationships. Structurally, the piece has a 24-bar form: The A section is 14 bars and the B section is 10 bars. There is quite a bit of shifting time in this piece. Time becomes elastic. Phrases expand and contract. This gives a fluid movement to the music.